May first – or May Day – is really working people’s holiday. So, tell your boss that you’re taking the day off. Yeah, right! But seriously, this day was established by generations of American workers back in the 19th century as the day for workers and their families. And it spread world wide, way before there was a world wide web, and May Day as a working people’s holiday came to be celebrated in many other countries. But it started here, in the good, ol’ US of A. But recognizing May Day as the workers’ holiday was just too much for the American capitalist establishment – so it came up with “Labor Day” as THE holiday. The history of May 1 as a workers’ holiday is intimately tied to the generations-long movement for the eight-hour day, to immigrant workers, to police brutality and repression of the labor movement, and to the long tradition of home-grown American radicalism. Perhaps the first nation-wide labor movement in the United States started in 1864, when workers began to agitate for an eight-hour day. This was, in their understanding, a natural outgrowth of the abolition of slavery; a limited work day allowed workers to spend more time with their families, to pursue education, and to enjoy leisure time. In other words, a shorter work day meant freedom. It was not for nothing that in 1866, workers celebrated the Fourth of July by singing “John Brown’s Body” with new lyrics demanding an eight-hour day. Agitating for shorter hours became a broad-based mass movement, and skilled and unskilled workers organized together. The movement would allow no racial, national or even religious divisions. Workers built specific organizations—Eight Hour Leagues—but they also used that momentum to establish new unions and strengthen old ones. That year, the Eight Hour Movement gained its first legislative victory when Illinois passed a law limiting work hours. The demand for an eight-hour day was about leisure, self-improvement and freedom, but it was also about power. When Eight Hour Leagues agitated for legislation requiring short hours, they were demanding what had never before happened: that the government regulate industry for the advantage of workers. And when workers sought to enforce the eight-hour day without the government—through declaring for themselves, through their unions, under what conditions they would work—they sought something still more radical: control over their own workplaces. The Illinois eight-hour law was to go into effect May 1, 1867. That day, tens of thousands of Chicago’s workers celebrated in what a newspaper called “the largest procession ever seen on the streets of Chicago.” But the day after, employers, en masse, ignored the law, ordering their workers to stay the customary 10 or 11 hours. The city erupted in a general strike–workers struck, and those who didn’t leave work were forced to by gangs of their colleagues roaming through the streets, armed with sticks, dragging out scabs. After several days of the strike, the state militia arrived and occupied working-class neighborhoods. By May 8, employers and the state they controlled had won, and workers went back to work with their long hours. The loss of the eight-hour-day movement led also to a massive decline in unions, and the labor movement would not pick up in such numbers for almost two decades. The Illinois law and its defeat, however, were not forgotten. By the 1880s, a new labor movement had grown up in Chicago. This one was more radical and was dominated by immigrant workers from Germany. They remembered 1877, when a strike by railroad workers spread around the country. 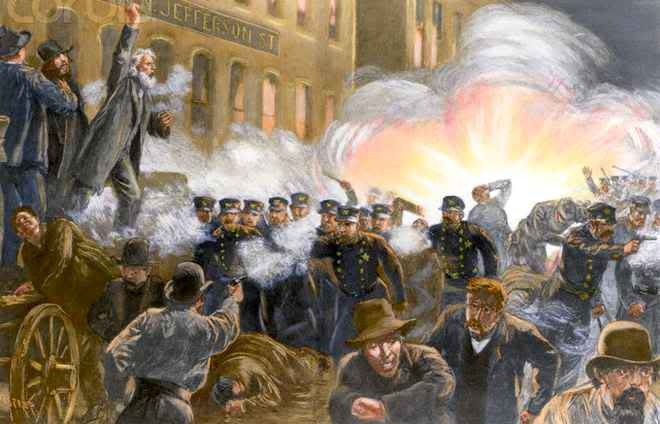 For a brief moment, as strikers took control of St. Louis and Pittsburgh, staring down the national guard and local police, nobody knew what would happen. But President Rutherford B. Hayes called out the army and brutally repressed the strike. They also remembered the state was rarely if ever on the side of the worker. Yet they also remembered the brief shining moment when it appeared that there might be an eight-hour day. We also know that the effect of the Haymarket bombing was far greater on the labor movement than it was on the police. Eight anarchist leaders were rounded up and put on trial for the murder of a police officer. No evidence was ever given that any of them threw the bomb, and only the flimsiest evidence was presented that any of them were remotely involved. Meanwhile, the government ensured more silence. The strike collapsed. Police around the country raided radicals’ homes and newspapers. The Knights of Labor never recovered. In the place of the radical industrial labor movement of the mid-1880s rose the American Federation of Labor, the much more exclusive and conservative organization that would dominate the labor movement until the 1930s. Meanwhile, it would take until the Fair Labor Standards Act of 1938 to finally enshrine the eight-hour day into federal law. May 1 would live on, mostly abroad. In 1889, French syndicalist Raymond Lavigne proposed to the Second International—the international and internationalist coalition of socialist parties—that May 1 be celebrated internationally the next year to honor the Haymarket Martyrs and demand the eight-hour day, and the year after that the International adopted the day as an international workers’ holiday. In countries with strong socialist traditions, May 1 became the primary day to celebrate work, workers and their organizations, often with direct and explicit reference to the Haymarket Martyrs. May Day remains an official holiday in countries ranging from Argentina to India to Malaysia to Croatia—and dozens of countries in between. Yet in the United States, with some exception, the workers’ tradition of May 1 died out. Partially this was because the Knights of Labor had already established a labor day in September. Opportunistic politicians, most notably Grover Cleveland, glommed onto the Knights’ holiday in order to diminish the symbolic power of May 1. In 1921, May Day was declared “Americanization Day,” and later “Loyalty Day” in a deliberately ironic attempt to co-opt the holiday. Even that was not enough, though, and in 1958 Dwight Eisenhower added “Law Day” to the mix, presumably a deliberate jibe at the Haymarket anarchists who declared, “All law is slavery.” Today, few if any Americans celebrate Loyalty Day or Law Day—although both are on the books—but the origins of May Day are largely forgotten. Like International Women’s Day (March 8), which also originated in the U.S., International Workers’ Day became a holiday the rest of the world celebrates while Americans look on in confusion, if they notice at all. Yet May 1 lives on, and indeed has been rejuvenated in the United States in the past few years. In 2006, immigrant activists organized “a day without an immigrant,” a nationwide strike of immigrant workers and rallies. It was perhaps the largest demonstration of workers in United States history. These immigrants, mostly from Latin America, had brought May 1 back to its birthplace, and in so doing they resurrected its history as a day specifically for immigrant workers. And in 2012 the Occupy Wallstreet movement also focused national protests for May 1. So our history can live on – and we can share it and keep it. Happy May Day!